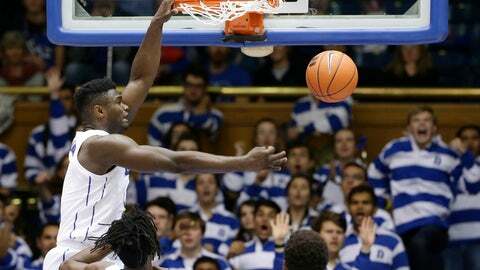 DURHAM, N.C. (AP) — Zion Williamson tossed up an alley-oop lob for RJ Barrett, and on the next trip downcourt, Barrett returned the favor by setting up a dunk for Williamson. Eastern Michigan: Not surprisingly, the Eagles threw a 2-3 zone defense at the Blue Devils — Murphy spent seven years on the Syracuse staff with zone savant Jim Boeheim. It wasn’t much of an impediment to the nation’s top-ranked team, though that seems insignificant in the long run because nobody in the Mid-American Conference will match Duke’s talent level.